If you need a boost and can't afford a real turbo or supercharger conversion, this product is for you. The Electric Supercharger is an adapter to either your short ram or cold air intake. It will work on absolutely any air intake brand including AEM, Injen, MimoUSA, Weapon R, Fujita etc. Simply remove your current air filter and put the Supercharger as a replacement, it's that simple. The supercharger is operated on a 12-volt source. This means you can connect it to your battery to get the power. It uses 2.2 amps from your alternator when turned on and doesn't affect your car performance or battery drain. The Supercharger is connected to a switch inside the car. Whenever you need more power you simply flip the switch and fly away. It produces 250CFM of forced air into your manifold and it very quiet under the hood when turned on. In fact it has a nice aggressive sound, making it seem like you got something bigger then what you actually have under the hood. A stock turbo from an Audi 1.8T produces 400CFM. Adding the electric supercharger will produce more then half of the power than a stock Audi 1.8T turbo would. There is need to do any modifications to your engine at all. 250CFM of forced air can also be compared to a 15-25 shot of Nitrous. 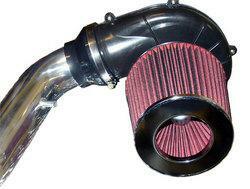 The supercharger is made out of the finest parts and a certified K&N Filter with Lifetime warranty. Installation is very simple, it should not take more then 15 minutes to install. Produces 15 - 25 horsepower increase. Generates 250CFM of forced air. Universal Bolt-on, installs on any short ram or cold air intake. Installation instructions and all necessary installation hardware included.